232 pages | 20 B/W Illus. After more than three decades of economic malaise, many African countries are experiencing an upsurge in their economic fortunes linked to the booming international market for minerals. Spurred by the shrinking viability of peasant agriculture, rural dwellers have been engaged in a massive search for alternative livelihoods, one of the most lucrative being artisanal mining. 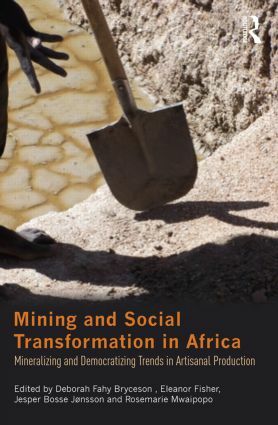 While an expanding literature has documented the economic expansion of artisanal mining, this book is the first to probe its societal impact, demonstrating that artisanal mining has the potential to be far more democratic and emancipating than preceding modes. Delineating the paradoxes of artisanal miners working alongside the expansion of large-scale mining investment in Africa, Mining and Social Transformation in Africa concentrates on the Tanzanian experience. Written by authors with fresh research insights, focus is placed on how artisanal mining is configured in relation to local, regional and national mining investments and social class differentiation. The work lives and associated lifestyles of miners and residents of mining settlements are brought to the fore, asking where this historical interlude is taking them and their communities in the future. The question of value transfers out of the artisanal mining sector, value capture by elites and changing configurations of gender, age and class differentiation, all arise. Deborah Fahy Bryceson as a Reader at the Geographical and Earth Sciences School of the University of Glasgow. Eleanor Fisher is Associate Professor in International Rural Development at the University of Reading. Jesper Bosse Jønsson is Head of Development Planning and Environment for COWI Tanzania. Rosemarie Mwaipopo is a Senior Lecturer in the Department of Sociology andAnthropology, University of Dar es Salaam, Tanzania.